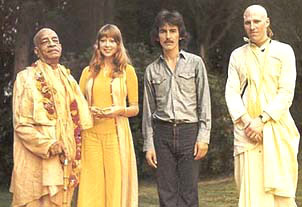 "I think Prabhupada's accomplishments are very significant; they're huge. Even compared to someone like William Shakespeare, the amount of literature Prabhupada produced is truly amazing. It boggles the mind. He sometimes went for days with only a few hours sleep. I mean even a youthful, athletic young person couldn't keep the pace he kept himself at seventy-nine years of age. "Srila Prabhupada has already had an amazing effect on the world. There's no way of measuring it. One day I just realized, 'God, this man is amazing!' He would sit up all night translating Sanskrit into English, putting in glossaries to make sure everyone understands it, and yet he never came off as someone above you. He always had that childlike simplicity, and what's most amazing is the fact that he did all this translating in such a relatively short time -- just a few years. And without having anything more than his own Krishna consciousness, he rounded up all these thousands of devotees, set the whole movement in motion, which became something so strong that it went on even after he left. "Even though he was the greatest Sanskrit scholar and a saint, I appreciated the fact that he never made me feel uncomfortable. In fact, he always went out of his way to make me feel comfortable. I always thought of him as sort of a lovely friend, really, and now he's still a lovely friend."